As you prepare for the festivities of the holiday season, it’s important to consider the many safety tips for holiday decorating. To maintain the highest level of safety throughout the holidays, consider the following tips. Many homeowners love to decorate their lawns, houses, and trees to liven up the neighborhood during the holidays. Safety tips for holiday decorating are especially important when you’re hanging string lights. 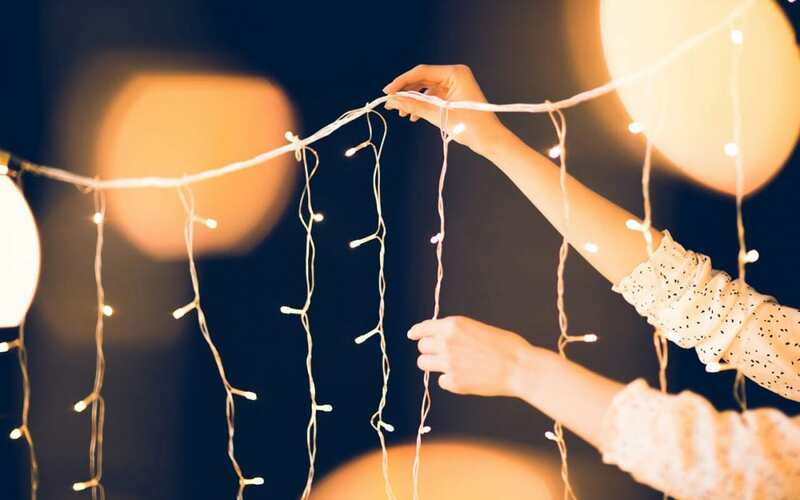 Before using any of the string lights you’ve brought out of storage, take a look at them all and run your fingers down the wires while they are unplugged. If any of the wires are worn or frayed, its best to just get rid of that set. Also, if you see broken or missing bulbs, replace them before hanging the lights. Make sure you are using the correct wattage bulb as indicated on the tag. Check the tags to make sure you are using indoor lights indoors and outdoor lights outdoors. Hanging string lights along a roofline usually involves climbing a ladder. When setting up your ladder, prop it at a 75-degree angle from the house on dry and level ground. If it is an extension ladder, it should be 3 feet taller than the edge of the roof. Always have someone by your side to help out when hanging string lights from a ladder. If you’d prefer to keep your outdoor decorations simple, it’s a great idea to try electric candles. You can place the candles inside each window of your house and they will glow from the exterior. Opt for electric candles over real candles to reduce the risk of fire. It is easy for someone to knock over a candle or for something flammable to come in contact with it. When you use a battery-powered candle instead, you get the same cozy atmosphere and flicker of light without the danger of a house fire. It’s nice to light a cozy fire on a cold night, but avoid adding anything into the fire other than wood. If you and your family are unwrapping holiday gifts, do not throw the wrapping paper or any packaging into the fire. Wrapping paper can cause the fire to burn out of control. If you have glass doors for your fireplace, shut them while a fire is burning. Keep a fire extinguisher close by in case of an emergency. The process of picking out a tree, hoisting it to the top of the car, and bringing it home is a beloved tradition for many families. However, a real tree involves maintenance. If you don’t want your tree to die or be a fire hazard, water it regularly. A dried out tree combined with a ragged set of string lights could be a recipe for disaster. If you bend a branch of your tree and it snaps, or if you shake it and lots of needles fall off, it needs more water. As beautiful as they are, poinsettias are poisonous. Knowing this, it’s best to keep them out of reach of your pets and young children. Or better yet, refrain from decorating with this festive flower. Holly and mistletoe are also toxic if ingested, so be mindful of which holiday plants you are bringing into your home. If you enjoy decorating for the holidays, invest in the items that will help you maintain a safe holiday season like a sturdy ladder, fire extinguisher, electric candles, and new sets of string lights. An artificial tree that is labeled as fire-resistant is a good alternative to a real tree that needs to be watered. Try these safety tips for holiday decorating and enjoy a safe and worry-free holiday season. Republic Home Inspections serves the Greater Las Vegas area with home inspection services. Happy Holidays!